Posted by clype in Europe, Glasgow, Humanities, Money, Scotland. Police on Thursday recovered a painting credited to Leonardo da Vinci that had been stolen from a Scottish castle four years ago by thieves disguised as tourists. Police said four men had been arrested. The painting was recovered in the Glasgow area. Detectives arrested four men yesterday when they recovered a stolen 30 million GBP Leonardo da Vinci painting in a raid on the offices of a prestigious law firm. Officers moved in to intercept a meeting called to finalise a deal for the return of ‘Madonna with the Yarnwinder‘, which was taken from the late Duke of Buccleuch’s home at Drumlanrig Castle, north of Dumfries, in 2003. It was the UK’s biggest art theft. The picture, which measures 500 x 355 mm unframed, was present during the late morning session at the offices of ‘HBJ Gateley Wareing‘ in WestRegent Street, Glasgow, and was reclaimed at the culmination of an 18-month surveillance operation. Police said four men, one from Glasgow and three from Lancashire, are expected to appear at ‘Dumfries Sheriff Court’ this morning. One partner in the legal firm, Mr.Calum Jones, was among those taken away by police. Sources said the Glasgow lawyer had been checking that a repatriation agreement would be valid in Scots law. It is understood other parties involved in the deal were an English solicitor, an art valuer, and a loss adjuster acting for the insurers of Buccleuch Estates. The estate said last night it was unaware of the agreement. Despite the priceless nature of the painting, it is thought that the late duke, who died last month, had already received an insurance pay-out of just over 3 million GBP, as the collection at Drumlanrig was under-insured. Dozens of officers from ‘Dumfries & Galloway Police’ and ‘Strathclyde Police’, ‘The Serious and Organised Crime Agency’, and ‘The Scottish Crime and Drugs Enforcement Agency’ took part in the raid, which will be seen as a major coup for the agencies. ‘At about 11:30 I noticed a lot of police activity outside. Three police cars and a police van had drawn up. There were no blue lights, no sirens. The next thing I knew two uniformed police officers were standing guard outside the entrance to the solicitors’ office. ‘It looked as though more than 10 plain clothes officers went into the office. A short time later, they brought men out of the office in handcuffs. ‘As they were brought out in ones and twos, they were put into the cars and the cars drew away. It all seemed to happen very quickly. There was no real fuss. ‘A number of plain clothes officers seemed to be involved in removing items from the building. That lasted about half-an-hour. One of the things taken away was a big paper envelope. Legal sources said that the partner was working to help an English solicitor on the repatriation deal and other senior ‘HBJ Gately Wareing’ staff were unaware of the project. They were said to be ‘shocked’ at the police raid but insisted he would be shown not to have been involved with any impropriety and had been acting only in a ‘lawyerly’ manner. It was authenticated yesterday afternoon by Mr. Michael Clarke, Director of ‘The National Gallery of Scotland’ and a renaissance art expert. The audacious theft on 2003-08-27, stunned the art world. Two men posing as tourists taking a tour of the castle overpowered a young female tour guide before snatching the painting from its wall mountings. Despite a full-scale police operation, they escaped and their getaway car was found abandoned nearby. Yesterday, the police finally caught up with the missing Da Vinci. Eyewitnesses described the scene in West Regent Street at 11:30. ‘A short time later, men were led in handcuffs from the solicitors’ office. The last man had a coat over his head. ‘A large silver-coloured box was taken from the office. Two police officers put it into an unmarked car. One officer was in the car, and was told to get another guy in there as well. ‘HBJ Gateley Wareing’s’ history dates back more than two centuries. Since January 2006, it has operated as a merged firm, incorporating the Edinburgh-based firm ‘Henderson Boyd Jackson’, and ‘Gateley Waring’, headquartered in Birmingham. It has other offices in Leicester and Nottingham. Managing partner is Mr.Malcolm Mcpherson, a former managing partner of ‘Henderson Boyd Jackson’ and chairman of ‘Hibernian FC’ from 1998 until 2002, until he resigned after disputes over the club’s direction. According to ‘HBJ Gateley Waring’s’ website, Mr.Calum Jones was educated at Dundee University and qualified as a lawyer in 1988. He is a partner in the company’s corporate department, specialising in corporate finance and corporate insolvency. From Kilmacolm, Renfrewshire, his interests are listed as golf, reading, wine and walking. A married man with children, his favourite sport is listed as rugby union although he supports Dundee United. A spokesman for the company declined to comment on yesterday’s events. It was the biggest art heist in UK history, with even the FBI being called in to help with the investigation. The theft in 2003 of Leonardo da Vinci’s ‘Madonna with the Yarnwinder‘ from Drumlanrig Castle, north of Dumfries, was classed by the US bureau alongside some of the most expensive and notorious worldwide. It was put it on the list alongside crimes such as the large-scale looting of Iraq after the 2003 war. The theft left the Duke of Buccleuch, who owned the painting, heartbroken. It had been in his family for more than 250 years, but was stolen in broad daylight from his ancestral home. It was a month to the day after his death, and four years after it was stolen, that the 30 million GBP painting — the finest in the duke’s collection — was found. The duke, born Walter John Montagu Douglas Scott and one of Britain’s biggest landowners, died after a short illness a month ago, aged 83, still the victim of a theft which pained him sorely. Only last year, the theft had moved up to seventh on the FBI’s own art crime list, and its image was displayed prominently on its website. The case appeared on the BBC’s ‘Crimewatch‘ two years ago, but until last night no developments had been announced or reported. ‘There were so many rumours when it was stolen. I know the duke was hit very hard by its loss. ‘But these paintings do appear again, because they are impossible to fence’ – they are so difficult to sell on in the black market, because they are so famous and well-known. The painting shows a young, beautiful Madonna with a child Christ holding the winder, which alludes to the domesticity of Mary and the child’s eventual fate on the cross. ‘The Madonna’ has a disputed history, although Leonardo is thought to have worked on it between 1500 and 1510 for The Secretary of State to French King Louis XII. There are two versions of the painting and it is not agreed among experts how much work Leonardo did on either. The other version is in the USA. The Buccleuch estate holds one of the UK’s finest private art collections, worth 400 million GBP, including masterpieces by Rembrandt and Holbein. In the robbery, on 2003-08-27, two men dressed as tourists overpowered a young guide and stole the painting from its display cabinet. With two accomplices, they escaped in a white Volkswagen Golf abandoned nearby. It has been speculated the painting may have been damaged in the process, as its frame was removed. Experts in art theft have long said they believed the painting was still somewhere in Scotland, rather than in London or abroad. Unless stolen ‘to order’, the fame of the painting and the magnitude of its theft would have made its sale on the black market very difficult. The painting, experts say, was likely to have been hidden in a small space, but could not have been rolled up — it is oil-painted on to board. Whatever the details of the case, the Buccleuch family have been lucky – some major art thefts are never resolved. The ‘Isabella Stuart Gardner Museum’ in Boston was hit by a huge art heist in 1990. Among the pictures taken were a Vermeer, two Rembrandts, and a Degas. ‘The Art Loss Register’ in London records more than 180 000 stolen artworks on its database. Its statistics show that only 15 per cent are recovered in the following 20 years. One of the most valuable paintings ever stolen in Britain, a portrait of The Madonna by Leonardo da Vinci, has been recovered by detectives more than four years after it was seized from a Scottish castle. In an audacious theft in August 2003, two men posing as tourists overpowered a young tour guide at Drumlanrig castle in Dumfriesshire and — in clear view of CCTV cameras — lifted the painting off the wall and escaped in a white VW Golf. Their getaway was photographed by other visitors but the thieves eluded capture despite an international investigation. Soon after the police investigation was wound down in 2005, the painting was added to the top 10 of the most-sought stolen art works in the world by the US Federal Bureau of Investigations. The painting, ‘The Madonna of the Yarnwinder‘, has been valued at more than 30 million GBP, and was the centrepiece of the private collection of the Duke of Buccleuch, one of Britain’s richest landowners, who died last month at the age of 83. His family had owned the painting for 200 years. Police in south-west Scotland said last night they had recovered the painting, in an operation also involving detectives from the Scottish drugs enforcement agency, the Scottish organised crime agency and Strathclyde police. Detective Chief Inspector Mickey Dalgleish, who led the investigation, said the force was ‘extremely pleased’ at its recovery. 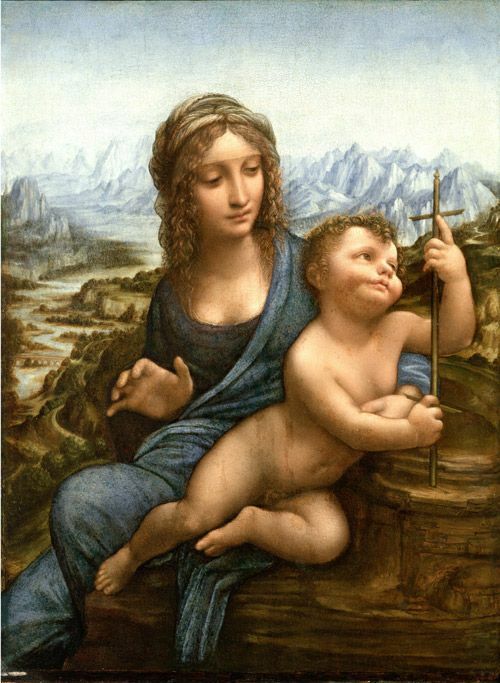 The masterpiece, which shows the Madonna holding an infant Jesus with a cross-shaped yarnwinder, was painted between 1500 and 1510 by Leonardo da Vinci for Florimand Robertet, secretary of state to the King of France, Louis XII. But there are doubts about its authenticity, with some speculation that it may be the work of his students. 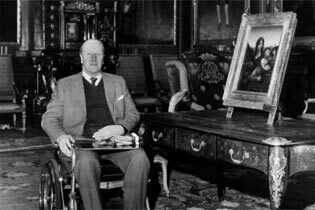 Insurers had offered a six-figure reward for the recovery of ‘Madonna of the Yarnwinder,’ stolen from Drumlanrig Castle, long home of the Duke of Buccleugh who died last month at 83. ‘Through careful investigations and intelligence-led police work, we were able to locate the painting and make four arrests,’ Detective Chief Inspector Mickey Dalgleish said. The Madonna, painted in the first decade of the 16th century, has a checkered and disputed history. Leonardo is known to have worked on it between 1500 and 1510 for the Secretary of State to French King Louis XII. But there are two versions of the painting and no one is quite sure how much work Leonardo did on either of them. The other version is in the United States. The Scottish version of the picture depicts the Madonna seated against a backdrop of hills and a serene sea. Christ sits on her lap holding a wooden winder, used to wrap yarn, which is shaped like a crucifix. In its style and feeling, the painting is often compared to Leonardo’s ‘Mona Lisa,’ which Leonardo painted at around the same time. It is considered one of Leonardo da Vinci’s finest paintings and its theft from the Duke of Buccleuch’s home in 2003 was one of the most audacious art crimes ever committed. But last night, it was announced that the 37 million GBP ‘Madonna of the Yarnwinder‘ had been recovered — and ‘The Scotsman Newspaper’ can reveal that a lawyer working for one of the country’s most successful and respected law firms was among four men arrested. The man, who was believed to be a partner in the firm but who had not been officially named, was arrested yesterday in the offices of ‘HBJ Gateley Wareing’ in West Regent Street, Glasgow. Police said the 16th-century painting – whose theft was regarded by the FBI as one of the world’s ten worst art crimes — was discovered following a raid in Glasgow. The three other men arrested were said to be from the Lancashire area. Last night, it was reported that the painting had been discovered by police at -HBJ Gateley Wareing’s- offices. The four men are due to appear in court today. A source close to the firm insisted to ‘The Scotsman Newspaper’ last night that the lawyer in question was not involved in any criminal act, but was acting as a go-between for two parties by scrutinising a contract that would have allowed an English firm to ‘secure legal repatriation’ of the painting from an unidentified party. Yesterday’s raid, said to be the result of a ‘long-term’ international investigation, involved officers from the Dumfries and Galloway and Strathclyde forces, as well as ‘The Scottish Crime and Drug Enforcement Agency’ (SCDEA) and ‘The Serious and Organised Crime Agency (SOCA)’. In a cruel twist of fate, the return of the painting comes too late for the Duke of Buccleuch to see it. He died last month following a short illness. The picture had been in his family’s possession for 200 years. The theft of the painting in broad daylight from Drumlanrig Castle, Dumfries, on 27 August, 2003, left police stunned. Using a ploy that could have easily appeared in a scene from the art-heist movie ‘The Thomas Crowne Affair‘, two men entered posing as tourists taking a tour of the castle. At an opportune moment, they overpowered a young, female tour guide before snatching the painting from its mountings. They escaped, despite a huge police operation, and their getaway car was abandoned nearby. ‘We are extremely pleased to recover “The Madonna of the Yarnwinder” painting. ‘Through careful investigations and intelligence-led police work, we were able to locate the painting and make four arrests. The recovery of this artwork is down to extensive police inquiries and the combined efforts of several Scottish police forces, the SCDEA and SOCA. ‘For four years, police staff have worked tirelessly on the theft and, with help from the public, we have been able to track down and locate the painting,’ DCI Dalgleish added. The picture was authenticated by Michael Clarke, the director of the National Gallery of Scotland, who travelled to examine the painting at an undisclosed location. The gallery showed the masterpiece in 1992 as part of an exhibition. Considered one of da Vinci’s masterpieces, the 1501 work is believed to have been commissioned for Louis XII of France. Despite the value of the piece, it is thought that the duke received an insurance pay-out of just over 3 million GBP, as the collection was underinsured. ‘News that police believe they may have recovered the Leonardo da Vinci painting stolen in 2003 has been warmly welcomed by our family. ‘HBJ Gateley Wareing’, the firm where the arrested lawyer worked, declined to comment officially last night. ‘A male lawyer at HBJ was acting as an agent on behalf of an English firm, who were acting to secure legal repatriation of this painting, to make sure a contract was binding in Scots law. ‘It appears the contract was being looked over in the West Regent Street offices in Glasgow. Their guy was acting absolutely above board. He was just being lawyerly. The law firm, which also has offices in Edinburgh, is synonymous with Mr.Malcolm Mcpherson, a former chairman of ‘Hibernian Football Club’, who is the senior partner of the firm. Formerly known as ‘Henderson Boyd Jackson’, it merged last year with ‘Gateley Wareing’, a Birmingham law firm. The combined company is one of the top 60 UK legal firms. ‘Scotland Yard’ had maintained that the painting was likely to be in the hands of drug traffickers and was being used as collateral for deals, and thus would not be recovered for years. Drumlanrig Castle, which houses one of the finest private art collections in Britain, also contains masterpieces by Rembrandt and Holbein. The castle was completed in 1691 and is one of the most important Renaissance buildings in Scotland. ‘The Madonna of the Yarnwinder’ is one of only a few paintings which have been authenticated as a Leonardo da Vinci. Art critics have described the painting as one of his most interesting and complete sketches. It is also regarded as one of the most important paintings to have been stolen in the UK in the past 70 years. He said the painting had been purchased in Italy in the 18th century by the third duke and had been conclusively identified as a work by the Renaissance master only in 1986 following scientific tests. Leonardo, born in 1452 at Vinci is often described as a ‘Renaissance man’, a genius who left behind a legacy of some of the world’s finest art. Two of his greatest works were ‘The Mona Lisa’ and ‘The Last Supper’, which attract millions of visitors each year and are the most reproduced artworks of all time. Their nearest rival is Michelangelo’s ‘Creation of Adam’. Leonardo’s drawing of ‘The Vitruvian Man’ is also iconic. He was also a scientist and engineer who designed prototypes for early ‘machines’ such as helicopters and telescopes. Scientists regard his research as unique and astounding for its time. He compiled hundreds of notebooks containing 13 000 pages of notes and drawings, many of which are a rare combination of art and science. Possessing a great deal of self- discipline, Leonardo spent hours every day, whether at home or on his travels, recording his observations and ideas for future projects. The journals were mostly written in mirror-image cursive script — some suggest that this was because Leonardo was left-handed rather than a necessary precaution in a time when church authorities persecuted free-thinkers who put science before religious beliefs. The Leonardo da Vinci painting joins Edvard Munch’s ‘The Scream’ and a host of Old Masters in the gallery of recovered stolen art. The Norwegian artist’s tortured image has, until now, epitomised fine art crime after two versions were stolen in a decade. One was first taken in 1994 from ‘The National Gallery’ in Oslo and recovered three months later. Another was stolen at gunpoint in 2004 from the city’s ‘Munch Museum’, along with ‘Madonna’, another of Munch’s paintings. It was recovered last year, but the museum later said it was damaged beyond repair. Rembrandt’s ‘Portrait of Jacob de Gheyn III’ holds the record as the world’s most stolen painting. After having been taken, and recovered, four times, the work at the Dulwich Picture Gallery in London has been nicknamed the ‘takeaway Rembrandt’. Even da Vinci’s ‘Mona Lisa’ has fallen victim to theft. It was stolen from the Louvre in Paris in 1911 and recovered two years later. Pablo Picasso was among those questioned about the theft, but it later emerged that a gallery employee had walked out with it under his coat. Other works recovered after being stolen include Renoir’s ‘Young Parisian’, his ‘Conversation with a Gardener’ and a ‘Rembrandt self-portrait’, which were taken in a raid on ‘The National Museum’ in Stockholm in 2000. In the United States, the FBI is involved in helping to trace stolen art, and has a top-ten art crimes listed on its website, which included ‘Madonna of the Yarnwinder’.